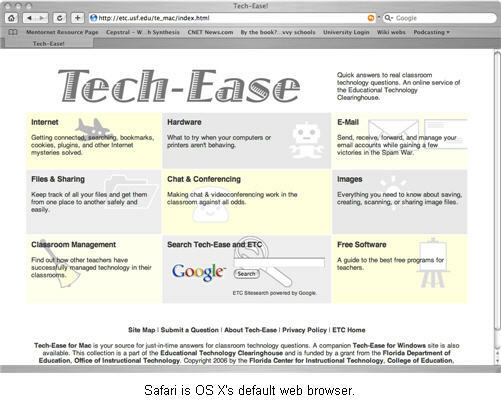 The default web browser on the Mac is Safari. In addition to being a web browser with many of the features of its competitors, Safari includes a few unique features. 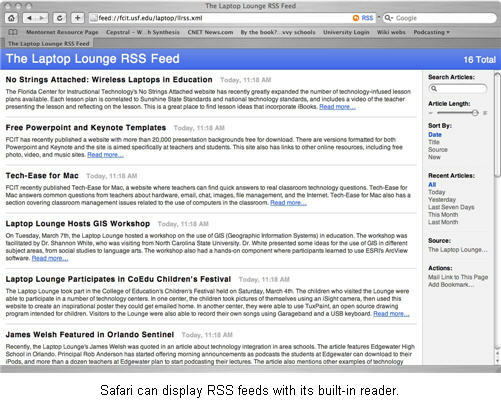 For example, it has a built-in RSS reader that allows you to view RSS feeds in a browser window. RSS feeds allow you to view the latest updates to a website as a list of headlines and summaries, each of which has a link to the web page where the full version of that content is available. In addition to Safari, there are other browsers that can be installed on the Mac, including a few that are cross-platform. Firefox is a free browser that can be downloaded from the website for the Mozilla Foundation. The Mac version of Firefox looks and works just like the Windows version. Another popular web browser is Opera. Originally available only as either a paid version or an ad supported free version, Opera is now available as a free download that does not display ads.